Standalone « Global Market Insights, Inc. 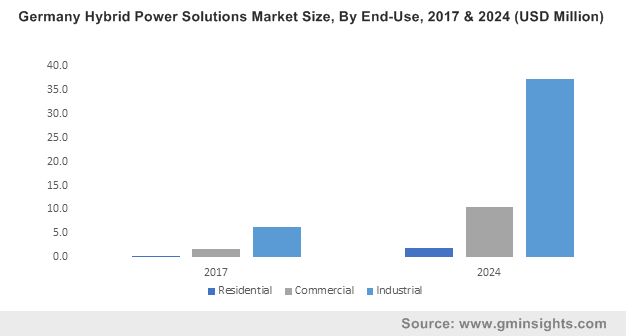 Hybrid power solutions market has garnered a considerably high traction over the past few years, primarily on account of the increasing demand for power generation with minimized fuel and reduced carbon emissions. In the face of the alarming price trends of petroleum products, potential contenders in the global energy landscape have been scrupulously thriving on renewable sources. The increasing popularity of hybrid power solutions market can be largely credited to this fundamental transition. 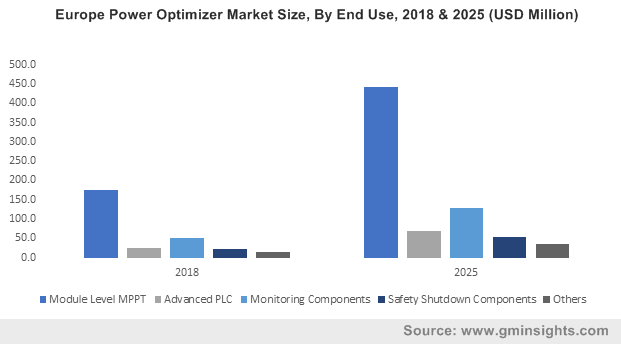 Moreover, lack of grid connectivity across remote belts and the subsequent unreliability in power supply often compel electric utilities to incline toward hybrid power system installation in recent years. The abundant availability of various governmental incentives such as feed-in-tariffs, subsidies, and leverage schemes further complements the business growth. In this regard, recently India’s Ministry of New and Renewable Energy (MNRE) recently enforced a new National Wind-Solar Hybrid Policy. Reportedly, this newly launched regulatory framework would be promoting huge grid-connected wind-solar Photovoltaics hybrid systems, in a bid to efficiently utilize the existing transmission capacity of the country. Needless to mention, these kind of regulatory initiatives have played a pivotal role in proliferating hybrid power solutions industry trends. Europe is claimed to be one of the pioneers of renewable energy and boasts of an enviable pipeline of wind, solar, and hydropower projects. The region also stands to gain significant monetary benefits in hybrid power solutions market as well, primarily augmented by the immense contribution of UK. According to estimates, UK hybrid power solutions market is slated to witness 5% CAGR over 2018-2024. The renewable energy directive 2009/28/EC has undoubtedly triggered new growth opportunities for the business space, with increasing deployment of microgrids, two-way power flows, and digital analytics. Incidentally, this has also prompted leading market giants to commercialize innovative solutions in the regional market that could potentially maintain the grid stability. In the year before last, Swedish power giant Vattenfall, commenced its construction project as a part of its first solar project in the . Located on the site of a signature Vattenfall’s windfarm in Wales that has been operational for near about 14 years, this Parc Cynog Solar Farm of 4.99MW is marked as a breakthrough project in UK hybrid power solutions industry. If reports are to be relied on, this is a part of a pilot project by the company, as it seeks to maximize the renewable energy generation potential from its existing sites in UK. The year 2016 has proved to be a roller coaster of sorts for UK hybrid solar power solutions industry. Just few months after Vattenfall made its way to the headlines, Ecotricity, another formidable player in hybrid power solutions market, won approval for its new hybrid renewable energy project in Britain. Reportedly, the green signal to its sun parks’ project in Devon and Dalby, gave Ecotricity a scope to expand its already existing portfolio in the lucrative business space. Sources also claimed that through this deal, the company even planned to generate 100 MW power from its solar-wind portfolio. The large-scale integration of multiple renewable resource in a single platform requires grid operation to be extremely fast, flexible and responsive. The contemporary innovations that hybrid power solutions industry is presently characterized by is majorly influenced by this particular rationale. Another economic factor that has boosted the market trend is the declining price trends of wind turbines manufacturing over the past few years. As per the reports, in 2016, the average nominal installation cost of a small wind turbine recorded around 7000 USD/kW – 7500 USD/kW. Also it has been reported that average cost of solar PV module witnessed a decline of almost 0.5% over 2013-2016. These aforementioned factors in tandem with tremendous technological advancements in renewable energy technology is certain to push hybrid power solutions industry to attain remarkable heights over the ensuing years. Global Market Insights, Inc. forecasts the overall business space to exceed a massive valuation of USD 60 billion by 2024. This entry was posted in Sustainable & Smart Technologies and tagged Commercial, Grid Connected, Hybrid Power Solutions Market, Hybrid Power Solutions Market Growth, Hybrid Power Solutions Market Report, Hybrid Power Solutions Market Research, Hybrid Power Solutions Market Size, Industrial, Residential, Solar-Diesel, Solar-Wind, Solar-Wind-Diesel, Standalone, Wind-Diesel. Mounting government support with regards to the adoption of renewable energy has majorly propelled hybrid solar wind energy storage market. Regulatory bodies across the globe have set strict deadlines to drastically diminish the amount of greenhouse gases and to create a sustainable environment for the future of the planet. This has resulted in such initiatives like the EU 20-20-20 established in 2014, aimed at reducing greenhouse gases, increasing the renewable energy, and improving energy efficiency, each by 20% by the year 2020. Other regional governments are also catching up quickly on the trend, augmenting hybrid solar wind energy storage market. For instance, the Ministry of New and Renewable Energy of India is planning to build the world’s largest solar-wind hybrid mega project that will have a capacity of 160 MW, with the help of funding by the World Bank. Such large-scale projects not only validate the potential of renewable energy generation using hybrid systems but also the importance of energy storage. It thus goes without saying that the growth of hybrid renewable energy industry and hybrid solar wind energy storage market is directly proportional. The combination of two major renewable energies is slated to ensure a reliable and flexible source of energy as compared to standalone solutions. The storage system ensures resilient solution for providing energy even when faced with prolonged cloudy days with low wind speeds. With the prominent use of renewable energy, standalone hybrid solar wind energy storage market is anticipated to witness a profitable growth in the years ahead. A number of private sector-based companies have started to offer standalone hybrid solar wind energy systems for homes and businesses. For example, Maine based Pika Energy offers its users the combination of 1700 watt producing wind turbines and 6000-watt range of solar panels. With these, they add an energy storage unit such as the Tesla Powerwall and a very viable standalone hybrid solar wind energy system is created. The idea of standalone hybrid solar wind energy system is appealing to consumers who are looking to move away from the power security and financial constraints of grid dependence. On these grounds, standalone hybrid solar wind energy storage market share has been forecast to increase at a CAGR of 5% over 2017-2024. Incidentally, its counterpart, the grid connected hybrid solar wind energy storage industry is also projected to register steady growth over 2017-2024 due to the potential of uninterrupted power supply and effective capacity utilization provided by the grid connected system. Legislative bodies around the world have been making tremendous efforts to increase the adoption of renewable energy. The Department of Energy of U.S. has proactively deployed the utilization of renewable energy across the country. This has resulted to 18% of power usage in U.S. from renewable sources, in 2017. With a shift toward solar and wind power, the total electricity generation was an improvement over the 15% produced in 2016. The use of renewable energies also potentially ended the droughts in the West and a dip in gas emission through power generation and decline in consumer spending on power. Driven by the anticipated growth in the overall renewable energy space in the U.S., it has been projected that U.S. hybrid solar wind energy storage market will depict quite a commendable growth in spite of the Trump administration’s desire to cut renewable energy funding. The trend of encouraging renewable energy deployment has taken a massive upsurge across numerous other geographies. Say for instance, the Clean Energy Regulator of Australia set a Renewable Energy Target for 2020, which the country was confident at surpassing as investments in clean energy soared 150% between 2016 and 2017. The total investment in renewable energy in Australia rose to $9 billion and broke the previous record of $6.2 billion in 2011. 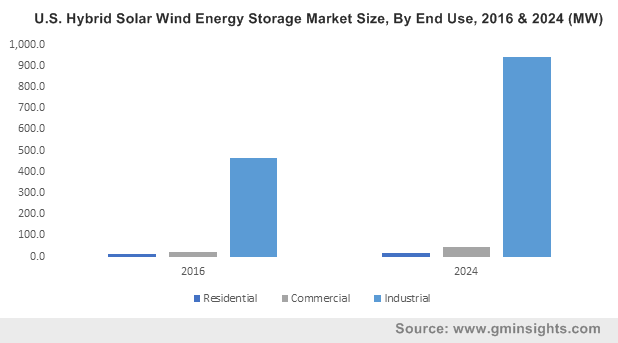 As initiatives for renewables adoption increase across myriad geographies, hybrid solar wind energy storage industry is expected to witness a tremendous surge in terms of volume and sales. As per estimates, hybrid solar wind energy storage market size is expected to cross a capacity of 1GW by 2024. This entry was posted in Sustainable & Smart Technologies and tagged Commercial, Global Hybrid Solar Wind Energy Storage Market, Grid Connected, Hybrid Solar Wind Energy Storage Market, Hybrid Solar Wind Energy Storage Market Report, Hybrid Solar Wind Energy Storage Market Size, Industrial, Residential, Standalone. Over the past few years, the overall self-checkout system market has grown by leaps and bounds courtesy the proliferation of retail outlets worldwide and the rising demand for a hassle-free checkout process. Numerous companies operating in the retail sector have been proactive in embracing cutting-edge technologies to alter the conventional norms of shopping. Citing an instance to highlight the rising influence of these systems, one of the most well-known apparel retailers Zara has recently implemented a self-service kiosk in its stores that let the buyer pick up orders that were placed online. Apparently, this would provide a personalized shopping experience to all consumers both in-store and online and aid them in making the right purchase decisions based on their personal preferences. It has been observed that multinational retail corporations along the likes of Walmart and Kroger have been optimistic in installing self-checkout systems across their grocery stores. Reportedly, Walmart plans to set up its self-checkout platform, ‘Scan and Go’, at around 200 stores by the end of 2018. On the other hand, Kroger has recently announced to roll out its self-checkout “Scan, Bag, Go” systems across close to 400 grocery stores. Apparently, these self-service kiosks would await consumers at the end of their shopping, where valid coupons would be tallied, and a final total would be calculated instantly. Needless to say, the development of such unique products by self-checkout system industry participants would assist a large number of retailers to cut costs and make the shopping experience more enjoyable for customers. One of the foremost firm operating in self-checkout system market, Fujitsu Frontech North America Inc., showcased a new cash handling and cashless self-checkout platform at the National Retail Federation’s 2018 Big Show and Expo. Apparently, the latest self-service kiosk is a smaller sized hybrid device that enables easier deployment and reduces remodel costs significantly. With the commercial launch of Fujitsu’s self-service kiosk, retailers would be able to provide better customer service by freeing the staff now devoted to checkout procedure. Subsequently, the launch of such innovative products the overall commercialization potential of self-checkout system market appears promising. In yet another instance that demonstrates the ingenuity of self-checkout system industry players, the Japanese conglomerate Toshiba has recently unveiled the next-gen self-checkout solution. The latest self-service device comes with sleek design complemented with complete modularity. Industry experts claim that the device would enable retailers to respond more swiftly to their business and customer requirements. The conceptualization of the device aims to challenge the prevailing norms by bringing about a drastic change in the retail sector, something which is likely to vigorously impel the growth prospects of self-checkout system market. While elaborating upon the self-checkout system industry trends, it is quite imperative to mention that there has been a marked increase in the apprehensions regarding jobs being lost over the inclusion of such technology. However, it has been observed that retailers redeploy employees to fulfill immediate requirements within the store and assign complicated tasks that demand human intervention. Hence, numerous businesses have been adopting these systems to reduce costs, boost productivity, and add value to their brand. 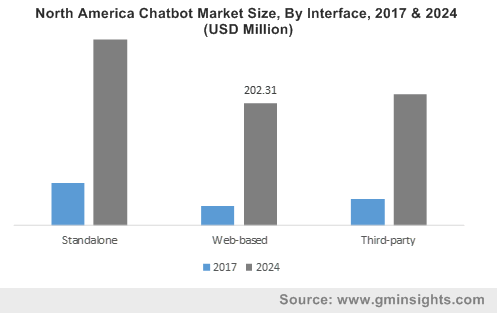 Moreover, the escalating requirement of automated solutions across emerging economies and the growing trend of infrastructure development would expand the self-checkout system market share in the ensuing years. 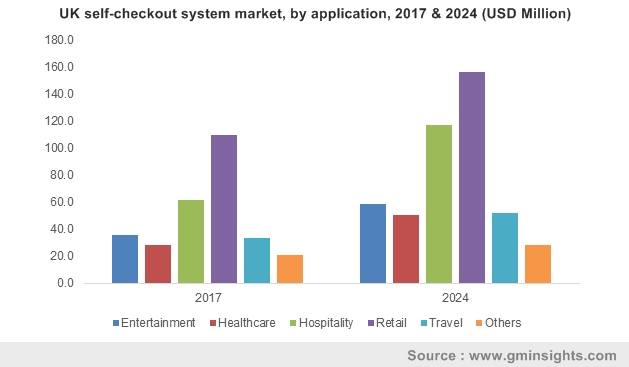 In fact, as per a report collated by Global Market Insights, Inc. the worldwide self-checkout system industry size is estimated to surpass an impressive USD 4 billion by 2024. This entry was posted in Electronics and Media and tagged Cash-Based, Cashless, Countertop, Hardware, Mobile, Self-Checkout Kiosk, Self-Checkout System Market, Self-Checkout System Market Analysis, Self-Checkout System Market Share, Self-Checkout System Market Size, Self-Checkout Systems Market, Service, Software, Standalone, Wall-Mounted. The medical sector is undergoing a series of interminable changes over the last few years. In consequence, healthcare revenue cycle management industry is set to witness a marked ascent pertaining to the rising need for timely bill reimbursements and insurance claims. Increased complexity in the medical coding process has led to the necessity of revenue cycle management solutions that help reduce billing errors. Healthcare spending is projected to grow rapidly over the span of the next few years, which will lead to the government implementing cost-cutting measures such as reduction in bill reimbursements, which would have a positive impact on healthcare revenue cycle management market. The rise in the number of medical care providers adopting revenue cycle management practices will further augment the revenue scale of this industry. The healthcare sector has been on a continually expanding spree across the globe, which has led to a surge in the implementation of revenue cycle management services across myriad geographies, particularly advanced economies such as Germany and the U.S. 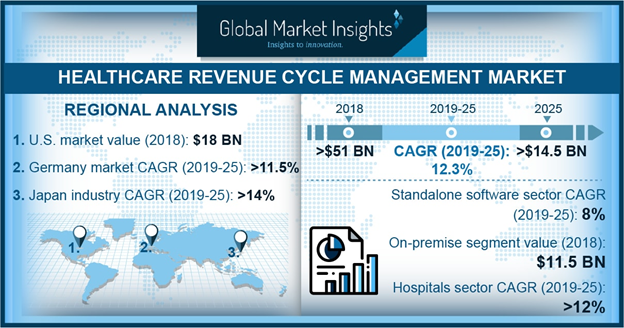 Indeed, a report by Global Market Insights, Inc., claims that Germany healthcare revenue cycle management market is anticipated to witness a CAGR of 11.3% over 2018-2024. The region is a vastly developed zone with extensive healthcare expenditure that has helped augment the regional industry. Currently, as per estimates, Germany also plays host to an expanding geriatric population that is highly susceptible to chronic infections. This would help upsurge the number of hospital admissions, consequently leading to an expansion of the regional healthcare revenue cycle management market. That said, the nation is also remnant of technological advancements – the development of upgraded software in order to processing huge patient databases and their hefty adoption in Germany will also propel the regional healthcare revenue cycle management market over 2018-2024. The United States is also touted to be one of chief regional growth avenues for the global healthcare revenue cycle management market. The U.S. Patient Protection and Affordable Care Act signed in 2010 has enabled several changes in the medical sector, which has ensured compulsory medical insurance and increased Medicaid coverage in the U.S. This statute is expected to significantly propel U.S. healthcare revenue cycle management industry in the years to come. Not to mention, the region is also governed by a stringent regulatory landscape, coupled with the existence of strong market players that will help augment the regional industry trends. The surging development in cloud computing industry has increased the necessity of cloud services in practically every industry, the healthcare sector bearing no exception. In fact, as per a reliable estimate, cloud based deployment held close to 76.4% of the overall industry valuation in the year 2017. The deployment model is claimed to accrue substantial popularity, given the surging usage of cloud-based software to ensure efficient data processing. Cloud based software, in the medical industry, are essentially deployed for analyzing revenue cycle data such as charges, accounts, and transaction receivables. In addition to such software being able to resolve problems and reduce errors, they also help deliver data security, that further helps expand the commercialization potential of the cloud-based healthcare revenue cycle management market. Most of the prominent players in healthcare revenue cycle management market have been striving to bring forth an array of novel products to the mainstream to sustain their position. Say for example, last year, MedTek, one of the leading providers of coding, transcription, and billing services, brought to light, the Revenue Cycle Edge, a highly comprehensive solution for revenue cycle optimization. With this HRCM solution, the company generated a seamless workflow for the overall revenue cycle process for medical care leaders working toward greater efficiency at clinics, hospitals, specialty practices, and ambulatory surgery centers. Speaking of which, some of the other players accumulating a major share in healthcare revenue cycle management market include Athenahealth, CareCloud, Allscripts Healthcare Solutions, Experian, Cerner, Siemens Healthcare, GE Healthcare, Quest Diagnostics, and McKesson. This entry was posted in Healthcare & Medical Devices and tagged Cloud-based Revenue Cycle Management Market, Healthcare Revenue Cycle Management Industry, Healthcare Revenue Cycle Management Industry Report, Healthcare Revenue Cycle Management Market, Healthcare Revenue Cycle Management Market size, Integrated Healthcare Revenue Cycle Management Market, On-Premise, RCM Market Size, Revenue Cycle Management Industry Trends, Revenue Cycle Management Market Share, Standalone, U.S. Healthcare Revenue Cycle Management Market Size.